The following is a partial list of subject headings related to Social Work that can be used to locate books and other items in the FAU Libraries Catalog. Welcome to the FAU Libraries subject guide for Social Work. This LibGuide includes information resources including databases, journals, books and more. Use the tabs at the top to find resources and information to help you research this topic. Databases: this page provides links to databases, or large, online collections of journal articles which can be searched by subject. Some databases also provide statistics and figures, streaming video, and legal information. OneSearch searches many of the databases at one time. Journals: read scholarly literature published by professionals in the field. Books: access the FAU Libraries catalog to locate books and other library materials owned by the libraries. Websites: not all information on the internet is junk! 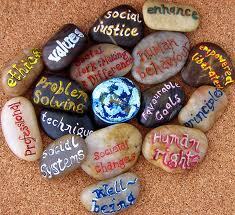 This page links to reputable organizations and agencies that focus on Social Work. For assistance in using the library or conducting research, contact myself or another librarian!